The Nishikawa area of Yamagata prefecture has long been a center of mountain worship based on the Three Mountains of Dewa (Dewa sanzan): Mt. Gassan, Mt. Yudono, and Mt. Haguro. Many pilgrims came from far-awdistant places, even as far off as the Kantō region, and followed the 24 km long highway that runs through the town from east to west. Remnants of the mountain cult can still be found in temples, shrines, and ruins in the area. When Iino Hiroo became the last paper maker in the Iwanesawa district, he changed the name from Nishiyama washi to Gassan washi and continued to engage in and teach papermaking up until 1995. The photographs taken in the mid 70’s show the family business in action. In 1989 in the Ōisawa district of Nishikawa, a papermaking studio was built in the Shizen to Takumi no Denshokan (Nature and Craft Museum). Iino Hiroo declined to work at the studio feeling that the 30 minute drive from Iwanesawa to Oisawa was too much at his advanced age, so Miura Kazuyuki, who was training as a papermaker in Ogawa, Saitama Prefecture, was invited to be the instructor for the papermaking studio. After Miura moved to Nishikawa, he worked with Iino mastering the production of the Gassan washi and eventually became the one and only papermaker in Nishikawa. The Ōisawa district is a valley running southward from the headwaters of Sagae River located deep within the far southwest of Nishikawa. Looking north from Ōisawa, Mt. Gassan appears above the clear river. This area is sometimes called “the Japanese Tibet.” Near the old highway along the river where in the winter the heavy snowfall piles up over two meters in height, stands the ruins of a huge temple whose lines of foundation stones mark an area the size of a soccer field or a small village. Gassan washi is characterized by its effective use of locally produced paper mulberry (kōzo) to bring out texture of the natural fiber. The paper made by Iino was dried on boards that gave his paper a natural soft texture. The traditional size for the Gassan washi is 30.0 cm x 79.0 cm. Even after Miura took over the production, the paper has not changed and still brings out the texture of the paper mulberry. Lets take a look at the process of producing Gassan washi papermaking. The kōzo (paper mulberry) branches are harvested just before the snow sets in at the end of November. 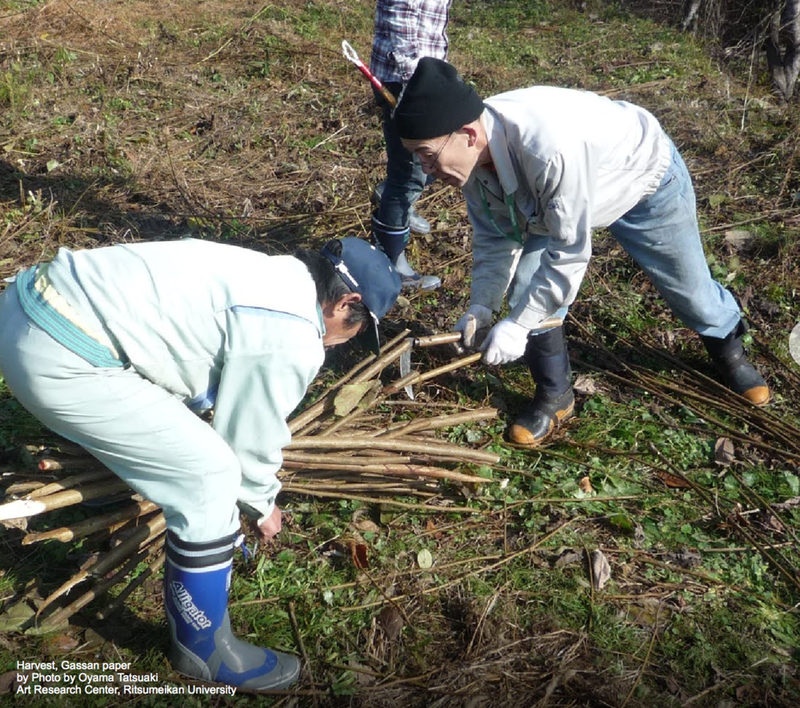 The harvested branches are then cut to about 70 cm. The cut kōzo branches are bundled together and set in a covered bucket to steam for two hours. Immediately after steaming, water is poured over them so that the outer skin contracts making it easier to strip. The skin of the steamed kōzo can be easily peeled off by hand. Since this needs to be done before the branches cool, local people and college students come to help out with the work. The peeled skin is dried in bundles. Then, the dried paper mulberry skin is soaked in water again and the surface skin is shaved off using a knife. Paper mulberry that still has the outer skin is called “black bark” (kurokawa) and the stripped paper mulberry inner skin is called "white bark" (shirokawa). The shirokawa is then dried. This process is still done with the help of the Iwanesawa locals. The shirakawa skins are then boiled for two hours in a solution of water and soda ash (sodium carbonate aqueous solution). The boiled paper mulberry fibers are washed in water to take the soda ash off. After thorough rinsing, scars and knots left in the fiber are taken out by hand one by one. The cleaned paper mulberry fibers are beaten into pulp. In the old days, this used to be done by hand beating the paper mulberry fibers with a wooden stick on to a board, but now naginata beaters and electric beaters are used. The pulp is put into a vat filed with water and the fibers distributed by moving the harrow back and forth. A bamboo pole is also used to thoroughly mix the fibers, and then a viscous agent (neri) is added and the vat mixed again to create the bath for forming paper. Adding the neri emulsifies the pulp so the paper mulberry fibers are uniformly suspended in the vat. The viscous liquid from Abelmoschus manihot (tororoaoi)roots is used for neri. The paper is made using a sugeta, which is a bamboo screen set in a deckle, or frame mold with handles. It is possible to swish the pulp back and forth on the screen because of the viscocity of the neri. The solution is scooped in at the front and then swished back and forth so that the pulp spreads evenly over the screen. Depending on the type and thickness of the finished product, the movement will differ. Because the amount of pulp in the solution decreases with each sheet of paper made, fine adjustments are needed to maintain the same thickness in each paper. We have some New Gassan Wallets at our store in various colors.